In a four-quart saucepan, bring the water to a boil. Lower the heat to medium. 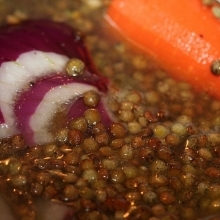 Add the lentils, basil, Italian seasoning, and bay leaf, and simmer for half an hour. Add the tomatoes, carrots, potatoes, onion, celery, bell pepper, and kale, and simmer for another half hour. Blend less than of the soup in a food processor or blender until smooth, and return to the pot. Remove bay leaves before serving.